In 1914, John "Jack" Jones, a former organizer for the Wobblies (Industrial Workers of the World (IWW) had started several weekly forums at the Radical Book Shop on North Clark Street in Chicago. The forums discussed labor issues along with social concerns of the day. Soon, in early 1915, Jones needed a new venue as the capacity was exceeded at the forum. To accommodate increased participants, Jones found a decrepit barn on Tooker Alley, off of Dearborn Street in downtown Chicago that he would name the Dil Pickle Club. Soon after, fellow labor organizer from Ireland, Jim Larkin would join Jones along with the "hobo doctor" and anarchist Ben Reitman. Reitman would be instrumental in getting regular news coverage of the Pickle in the Chicago Daily News and Chicago Tribune. The news coverage would help increase the clubs following and by 1917, Jones created the Dil Pickle Artisans by officially incorporating it as a non-profit in Illinois for its promotion of arts, crafts, science and literature. During the early years of the Dil Pickle Club, Jones began the Dil Pickle Press which produced material to promote the club. The Dil Pickler newsletter, The Creative World bulletin along with Jones' book Tech-Up were printed. The Press also printed Arthur Desmond's Lion's Paw, Ragnar Redbeard's Might Is Right along with works by Sol Omar and J. Edgar Miller. Most of the literature was often crudely designed but easily reproduced. It contained humor and often typos. Admission to the club and refreshment sales helped it survive financially. Jones may have also printed counterfeit out-of-print books in order to make additional money. The club would reach its pinnacle by not only serving as a place for debate and idea-sharing but a host for one-act plays, poetry readings, jazz dances, opera along with other acts. 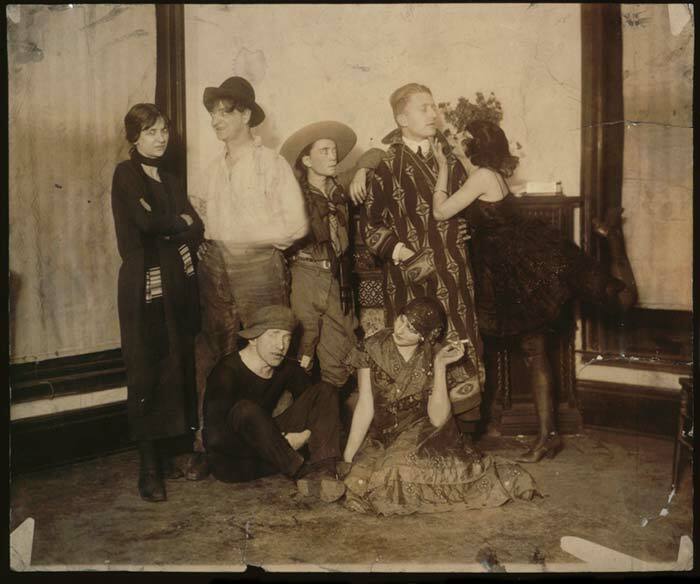 The Dil Pickle Players was formed in order to perform original works by local authors as well as contemporary playwrights. Jones was often very active in the club; building the stage, wiring the lighting along with writing, directing and acting in productions. During the Great Depression, the Dil Pickle Club began to experience its decline. By the early 1930s, the club was being frequented more by Chicago mobsters rather than the usual free-minded Bohemian attendees. Soon the club would lose its unique taste and personality as rent rates in Chicago were rising. Tax difficulties in 1933 would be the end of the Dil Pickle Club. 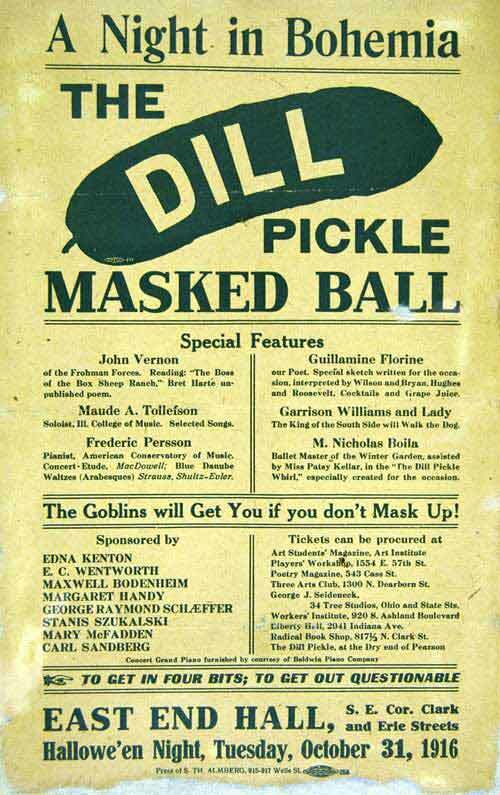 Despite Jones' efforts to save the club—which included the sale of the wooden Du Dil Duck toy—the Dil Pickle Club closed in 1934. Jones struggled financially thereafter until his death in 1940. Jack Sheridan, who had been attending the Dil Pickle Club since boyhood, tried to revive the club in 1944 in Tooker Alley premises, but the building was condemned as unsafe. The club was frequented by many radical American activists, political speakers and authors. It was accepting of homosexuals. Among the American activists and speakers was Clarence Darrow, Emma Goldman, Big Bill Haywood, Hippolyte Havel, Lucy Parsons, Ben Reitman and Nina Spies. American authors included Pulitzer Prize winner Upton Sinclair along with Sherwood Anderson, Carl Sandburg, Ben Hecht, Vachel Lindsay, Djuna Barnes, William Carlos Williams, Kenneth Rexroth and Vincent Starrett. Other common attendees were poet, writer and Wobbly, Slim Brundage, speaker Martha Biegler, speaker Elizabeth Davis, Harry Wilson and egoist F. M. Wilkesbarr (aka Malfew Seklew). A club for people with ideas and questions, it often attracted a mixed crowd. Scientists, panhandlers, prostitutes, socialists, anarchists, con men, tax advocates, religious zealots, social workers and hoboes were commonly at the club. Chicagoan George Wellington "Cap" Streeter was also said to have visited and spoken at the Dil Pickle Club.